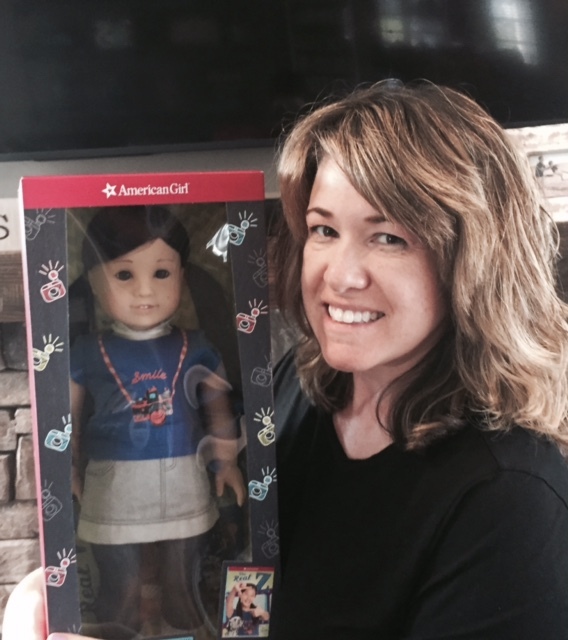 A Conversation with Jen Calonita, Author of American Girl Z Yang’s First Book! Three years after Mattel’s American Girl brand retired its only Asian American historical doll, Ivy Ling, it has introduced another, Suzanne Yang, who’s better known by her nickname, “Z”! Z Yang represents the latest effort in American Girl’s intentional push for greater diversity in its characters, something I wrote about in my previous post. Of course, with American Girl, a named character is never introduced as a doll and its associated toys alone, and Z is no exception. A serious vlogger, Z has a special area called the Z. Crew on the real American Girl website; it shows stop-motion videos that the character has made. There’s also an Amazon.com special premiering June 9, American Girl: Summer Camp – Friends for Life, in which Z is the lead character. Swag: One month before the Z Yang doll premiered, I took these pix at American Girl Place at The Grove in L.A. Kids can get a t-shirt that’s identical to Z’s, as well as a zip-up iPad/tablet cover that looks like a movie clapboard and a USB flash drive/keychain that looks like, well, Z. And as always, there are books! The first is entitled The Real Z, and it’s really good! I truly enjoyed it, and more importantly, my daughters enjoyed it as well, devouring it in one day each! The author of The Real Z, Jen Calonita, is a best-selling novelist whose popular middle grade and young adult fictional works include the Fairy Tale Reform School series and the Secrets of My Hollywood Life series. She was very kind to take the time to correspond with me about The Real Z and the work that went into writing the story! I’m privileged to share our conversation here, very slightly edited for clarity. F.A.D. : You’re a best-selling writer who has written 18 novels previously. What was different about writing for an iconic brand like American Girl? JEN: It’s funny because I have two boys and my sister has two girls, and out of the two of us, I can be the real girly girl! So when it came time for her two girls to have their first American Girl experience, my sister let me take the girls to the store in New York City to have lunch and pick out their first dolls. I loved every minute of it! I love American Girl’s message of empowerment, and I always tell my nieces they can do anything they put their minds to. So when I was asked to work on the American Girl project, I felt like I won the Lotto. I feel so proud to get to work with them. They have a very clear vision of what they want for their characters, and it was fun to see Z’s first book come together. F.A.D. : Z is 13 years old, making her older than most other American Girl characters, who are usually no older than 10 when readers first meet them. Do you feel like it was easier or harder to write the story with an older set of child characters? JEN: For myself, I write middle grade characters that hover around 12 or 13, and my son is 13, so I have a lot of girls in my life at this age. I feel like I live 13 every day! So for me, I enjoyed getting to write about a 13 year old. F.A.D. : There’s quite a bit of expectation for Z Yang among Asian American fans of American Girl, given that she is the first Asian American doll with a definitive story line since Ivy Ling (controversially retired in 2014). Did this create any additional sense of pressure for you? JEN: Of course, but it was definitely pressure I put on myself. American Girl knows their characters’ backstories inside and out, and have such a well-thought out plan for their dolls and their book series, so that really put me at ease. Plus, I made sure to talk to a lot of American Girl book fans and girls that are Z’s age to make sure I was hitting her friendship struggles the right way and handling her relationships appropriately. Z puts a lot of pressure on herself as she’s working on her project, and I think that’s true of most girls – and adults! – when they are working on a project they love. F.A.D. : In the book, you refer several times to things that many Asian Americans, especially those of Korean heritage, appreciate as a part of regular life – kimchi, chocolate Pocky, bubble tea, bossam, and bulgogi, for instance. What has helped you to become more familiar with Asian American culture? JEN: I wanted to make sure I was familiar with Asian American culture when I sat down to write Z’s story, whether certain aspects ever came into play or not, so I interviewed several Asian American families, teachers, moms, and kids before I wrote the story. Several Korean American tweens and I texted when I ran into questions. A lot of the time I had questions about snacks! I made sure to try them when I could find them, too. My boys are now obsessed with bubble tea and I love chocolate Pocky, and we found a bubble tea shop near our house so I went in several times to talk to the teens who worked there about things as well. My eight year old would ask me, “Do we need to buy more snacks to try? Because I will.” He was very helpful! F.A.D. : Z’s friends are quite a diverse bunch! Her closest two friends are Caucasian and Latina, while one of her vlogging friends has a disability and another is British and lives overseas. How do you think kids benefit when they have a diverse group of friends? JEN: I loved hearing about Z’s friends when I was working on the project. Some of her friends are ones that have appeared in Z’s YouTube American Girl videos, and others are new. I think it’s so important for kids and adults to be open to new experiences and meet people from all walks of life and all over the map, so they can learn more about the world around them. Every time I visit a new city and meet school children, I’m amazed at how different their school experiences can be compared to my own or that of my children. I love that Z has so many wonderful friends – both the ones she’s met online and the ones in her everyday life. My mom always pushed me to make friends outside school. I remember her purposefully not letting me go to the dance school in town! She drove me to another area so I’d be forced to meet new people, and I look back on that and am so thankful that my circle opened up because I wasn’t in my familiar surroundings. I try to do the same thing with my own boys now. F.A.D. : Like many tweens and teens, Z often uses technology and social media to communicate with friends and family. What benefits and limitations do you see to the frequent usage of these tools? JEN: Insert audible groan here! As someone whose oldest just got his first cell phone, I find it’s a constant struggle between what he wants to do online and what’s appropriate for him to do online at age 12. There are several apps his friends have that I don’t feel comfortable letting him use. It’s tough because kids want to be part of a crowd, but there are many things available online that aren’t right for their age. We talk a lot about how once a picture or video is online, it’s up there FOREVER. So we had constant discussions about what Z and her friends could do online, what was appropriate, and what wasn’t. We made sure that even though Z is a filmmaker, her films have to be shown to her parents before she posts anything, and that’s something really important for kids to understand. Parents are there to have their back, and Z’s really do in this story. F.A.D. : The city of Seattle is such a big part of the story. How did you become so familiar with its landmarks? JEN: I’d been to Seattle once on a book tour, and I fell in love with the city. I’ve always hoped to take my family back. I’m somewhat familiar with the big landmarks because I’ve visited them, but I knew I needed to do more, so I did a lot of travel research and looked at a lot of pictures. When it came to the area Z would live in, my editor and I spoke with friends who live in Seattle and asked them about the neighborhoods, so we could figure out the best place for Z to live where she could be near school and shopping but also have a somewhat suburban neighborhood as well. F.A.D. : To me, The Real Z‘s most poignant scenes take place when the characters are showing vulnerability, whether that’s through their attempts to reconcile or through their admissions of their fears and insecurities. What would you like for readers to take away from these parts of the story? JEN: When Z’s project comes together, and she creates the “Real Z” hashtag, I felt really proud of her and all the girls who would read this story. Connecting with friends and realizing that others have the same insecurities and fears as you do is important at this age – at any age really – and sometimes the tween years can be confusing. I hope they see how Z and her friends come together and, through their honesty, their friendship grows even stronger. F.A.D. : My favorite line from the book is “Life isn’t perfect. Why should we pretend it is online?” Do you have a favorite line from The Real Z? JEN: I think you found it! It’s something I say to my 12 year old all the time. We didn’t have social media when I was his age, so I’m constantly telling him that not everything in life has to be put online – it shouldn’t be – and some of what you read and see online is this small, perfect-moment window that doesn’t really reflect real life. I actually posted a picture of the brownies I baked for the church bake sale recently – smashed and ruined when they fell in the car – because that was REAL. And I think that’s a struggle Z faces in the book. How can she be true to herself and true to her film, while still making it shine? F.A.D. : In its promotional materials, American Girl emphasizes that its products and books are designed to help girls connect with each other and to empower them to confidently be the best they can be. How does The Real Z try to help girls in those areas? JEN: I believe girls will relate to Z’s struggles when it comes to friendship and wanting to succeed at something they’re passionate about. When Z tries to be someone else with her film, it doesn’t feel authentic. I think we all do that sometimes. We’re afraid to show people who we truly are. When Z and her friends learn to open up to each other, it makes her film come together and it makes their friendship even stronger. Being truthful is tough but so rewarding, and Z sees that in her story. I hope girls will connect with Z the way I did. I can’t wait to see what she’s up to next.